I just completed making my first flower essence yesterday from one of my beloved orchids: Paphiopedilum Haynaldianum. My dear friend Don Dennis, creator of Living Tree Orchid Essences, encouraged me to make the essence, letting me know that to his knowledge, no one anywhere in the world has made a natural healing remedy from this particular orchid. Needless to say, I feel honored and humbled that it would be up to me to make the first flower essence from Paphiopedilum Haynaldianum. Before I tell you about my new orchid essence and the specific blessings I feel it is giving us, I have to give you a little background. First, I have used flower essences from all over the world in my healing practice for decades. I have flower essences from Australia, Ireland, Scotland, Denmark, Holland, Canada, the Himalayas, England and all over the U.S.A. In fact, I have so many flower essences that I could not actually tell you specifically how many I have currently, how many I have used over the years or how many I know about. My shelves are full of reference books about flower remedies and I am always studying to learn about new ones. Flower essences are critical in holistic alternative medicine because they clear the emotional, mental and spiritual causes of illness. In addition, each flower essences opens and balances specific energy centers, which many include acupuncture meridians or chakras anywhere in your energy body. Illness generally begins in the energy body and comes in to manifest in the physical. By the time you are experiencing physical pain or disease, you have been feeling certain emotions, thinking about damaging beliefs and possibly experiencing imbalances all the way to the level of your soul. To clear disease thoroughly and completely, you must address not only the physical aspects but also the energetic, emotional, mental and spiritual components. Second, this orchid flower essence comes to bless me at a very critical time in my life. After living and working out of my home for the past 17 years – longer than I have lived or worked anywhere in my entire life – my fiancé Ken Holmes and I have bought a new home in Trinity, Florida. We hope to move there later this summer. I plan on continuing to work from my new home, healing clients all over the world by phone and on the Skype and in person at the new office I plan on establishing. My life here in Atlanta is nothing short of completely fulfilling. I absolutely adore what I do. I love my clients. I love my yoga students. My all organic garden and the orchids that bloom continuously in my studio uplift my soul like nothing I have ever experienced before. This is the place where I have written my two most recent Amazon No. 1 best sellers – What Is Healing? Awaken Your Intuitive Power for Health and Happiness and Unlimited Energy Now. In fact, I would be so bold to say that I have a better life – a happier and more fulfilling life – than anyone I know. And yet as wonderful as it has been, it is now time for another chapter in another part of the world with my fiancé Ken Holmes. I have been telling my friends and clients generally one or two a day, as when I share the news, inevitably my friends and clients end up crying, often for as long as a day. I receive texts in the middle of the night how upset everybody is that I am leaving. I share this grief as when I look out at my garden or lie in my hammock and stare up at the hawks circling over the forest across the street, I feel I am living and working in actual heaven on earth. There is a Bach flower remedy called Walnut that also addresses the issues behind a time of great transition. It helps you to adjust to major changes. I know about Walnut but in this case feel it is not the precise remedy I need or that would assist my friends and clients. I had taken a photograph of my beloved orchid on my Facebook timeline and also shared it with the orchid essence maker Don Dennis. Don encouraged me not only to make a natural healing remedy from this orchid, but to do so right away. I had been planning on making the essence all by myself. However, on Thursday I told my long-term client Charlenne Carl about the transition I am making. Like everybody else, Charlenne was moved to tears. So after our session on Friday, I asked Charlenne to help me set up my Paphiopedilum Haynaldianum to prepare for the essence making. I felt that by starting this project together, Charlenne could feel that she was also part of something very special. I used a non-cutting method encouraged by Don Dennis because this essence making process does no harm to the flower. After setting up the orchid to impart the essence in distilled water, Charlenne and I sat and meditated for about 20 minutes. We then left the room silently. About five hours later, I came back and mixed the essence with brandy, acquiring about 7 liters of the new remedy. My fiancé Ken Holmes and I then took the essence, sat and meditated to observe the effects. Ken was the person who first brought this orchid into my life as he had given it to me last year for my birthday. After blooming last year, it sat dormant in my studio until starting new buds in March and opening just a few days ago. My guidance had told me previously it is an essence about endings and beginnings, for when you are not yet able to see where you are going and have to proceed by faith alone. As I sat and meditated, I felt my sixth chakra open first, then my crown chakra and finally the minor chakra in my left hand, which is the energy center that allows us to receive. I was told that this essence allows us to receive the gifts of beauty. I do believe that we live in a beautiful world. It is my hope that my blog at www.catherinecarrigan.com conveys this message by sharing all the photos of my orchids and my garden. This morning, I bottled and labelled 12 one-ounce flower essence vials. It is my hope that this essence helps all of us – myself, my clients, my friends and my yoga students – to be able to make this transition more easily, maintaining our friendships and remembering that we are constantly blessed by the beauty and wonder of this world. 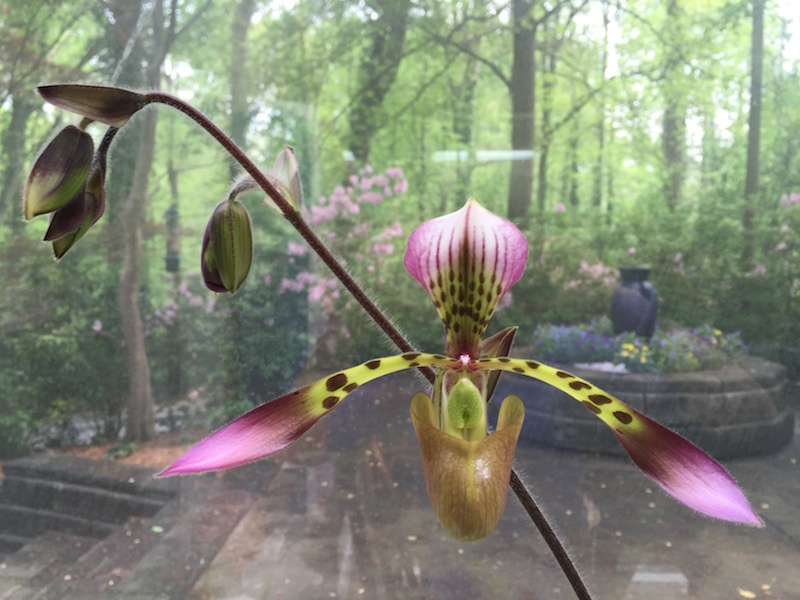 If you feel you might benefit from the essence of Paphiopedilum Haynaldianum, send me an email at catherine@catherinecarrigan.com. Together we can discover the healing message of this lovely orchid. This morning, I went down to check and my Paphiopedilum Haynaldianum was sitting in my window as happy as ever. “Thank you Paphiopedilum Haynaldianum,” I say from my soul. “Thank you Paphiopedilum Haynaldianum,” I say from my heart. We are all so blessed by your beauty. Catherine, this is truly amazing, as are you. I can feel the grace of this essence as you describe it. Thank you Nina! The orchid opened its second bloom today – I have been so busy I haven’t had a free moment to take a photograph! It is truly in all its glory, very very beautiful. You, Ken Holmes and Sue Maes all calibrate the flower essence at over 600 level of consciousness. I just sent two bottles to Don Dennis in Scotland to hear what the professional orchid essence maker has to say! Very exciting, such a blessing!! !